The Warriors are certainly not a team that have fans jumping ship to support them, the bandwagon supporters tend to flock to the successful sides, just like 2 Team Tracy. Whatever team is winning, that's the one they'll inevitably support. In saying that, it's really just stating the obvious to suggest that 99% of Warriors fans have been supporting the side since day 1, or for as long as they can remember for the younger folk......and maybe some of the older fans. 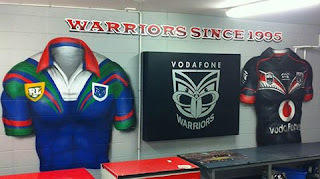 For a team that plays in a Rugby mad nation it would be easy to imagine, almost forgivable, for supporters to jump ship to Union and have the Warriors become just a distant memory from a time that used to be. Loyalty towards the club shown by the fans would be second to none in my opinion. I know plenty of people who are so called "supporters" of a footy side simply change teams without hesitation the moment times become a little tough. Not Warriors fans though and for that i applaud my fellow #Faithers for their unwavering support of this side we all love, the NZ Warriors. We've had some rough times and some brilliant times over the years. This rollercoaster has been one hell of a ride and i am not about to give this life time pass up for anything. As fans we ride the highs and we take the blows when the lows come around. At the end of the day we stand together and united as a Warrior Nation in the hope that the elusive first premiership is just around the corner.